Onboard 500mA resettable fuse to protect power supply from the USB port and the DC jack at the same time. 4 digit display: 4 digit tube (0.36 inches) which can display the clock point, it needs D10/D11 pins to control and display the integer, clock, stopwatch, score, etc. DS1307 clock: based on DS1307 high-precision real-time clock module, I2C interface, the address is 0x68. LM75 temperature sensor: I2C interface temperature sensor, not only can measure the temperature, it can also set the temperature protection temperature, the address is 0x48. Infrared receiver: use D2 pin, It can receive the modulated infrared signal of 38KHz that is sent by the IR transmitter module and demodulate it into logic level, and it can complete the infrared remote control with the codec program. 4-CH touch sensor: capacitive touch switch, only when you touch the corresponding position with your fingers, the module corresponding pin (D3 / D4 / D5 / D6) will output high level, otherwise it outputs low. Onboard DIP switch, you can disconnect the connection between the peripheral module on the board and the Atmega328P. Microcontroller: Atmel ATmega328P, working voltage: 5V, working current: 500mA (Max), IO logic voltage: 5V, 100% compatible with Arduino UNO R3 program, expansion shields, IDE. Rotation angle sensor: 10K ohm adjustable potentiometer knob angle sensor, use A0 pin, can be used for MP3 volume adjustment, 4-digit display brightness adjustment. Onboard Arduino Shield interface, can plug in compatible expansion shields. Serial MP3: MP3 music player module is based on high-quality MP3 music chip, use D7 / D8 pins to be software serial port, you can send commands to switch songs, change the volume and play mode and other operations. The board kit contains TF card, speaker, CR1220 battery, infrared remote control, and these are the necessary accessories for MP3, DS1307, infrared receiver. Lesson 4: Touch and debounce. (these use the Arduino IDE and Open-Smart software library). Current price: around £30/$40 per kit with international shipping. Water sensor: easy to use moisture sensor module. Under normal circumstances, if the module does not touch the water line, water droplets or conductive objects, the signal pin of the module is held high by a 1M ohm pull-up resistor. When the module is exposed to water or rain droplets then that becomes low. NTC Thermistor sensor line + adapter module: can be used to measure temperature directly in water. Widely used in temperature monitoring for indoor, outdoor, greenhouse, etc. You can plug the sensor onto the adapter module directly. Ultrasonic sensor: distance measuring module for non-contact measurement. It has high measurement accuracy and its blind area is close (up to 2cm). Specifications: Arduino library ready: HCSR04Ultrasonic. Working voltage: 3-5.5VDC. Static current: less than 2 mA. IO logic voltage: 3.3V / 5V. Induction angle: not more than 15 degrees. Detection range: 2-400 cm. Accuracy: 3mm. Adopt IO trigger through supplying at least 10us sequence of high level signal. The module automatically send eight 40khz square wave and automatically detect whether receive the returning pulse signal. Touch sensor: The module is based on a touch detection IC (TTP223-BA6), and the touch IC is in trigger mode (Toggle Mode). On power-up , the module sends a low or high output level (set by the board toggle switch ), the mode for low power mode ; touch of a finger when the corresponding position , the module will output the opposite level ( ie, the original output High , after touching a low output ; originally output low , after touching a high output ) , the mode is switched to fast mode ; when for 12 seconds without touching , the mode and switch to low-power mode. The module can be installed in such as plastic, glass surface non-metallic materials, in addition to the thin paper ( non-metallic ) covering the surface of the module , as long as the correct location of the touch , you can make hidden in the walls, desktops and other places buttons, switches. This module allows you to dispense conventional mechanical push buttons, switches troubles. Control Interface: A total of three pins (GND, VCC, SIG), GND to ground, VCC is the power supply, SIG digital signal output pin, the power-output high; Power light: Green LED, a power that is properly lit; Touch area: Similar to a fingerprint icon inside the area, you can touch the trigger finger. Selector switch: When the handle appropriated L side, it is set to the power output low; Similarly, when appropriated H side, the power output high. Specifications: Low power consumption. Power supply for 2 ~ 5.5V. Positive and negative can be used as a touch surface , DC can be an alternative to traditional self-locking switch. Voltage sensor: The voltage detection module is based on the principle of the resistor divider. The measured voltage can be reduced, so that the ADC pin of ar duino board can detect the voltage value after reduction, and the measured voltage can be calculated. Sampling resistor which is precision resistors, precision of 0.5% and a temperature coefficient of 50PPM, in order to effectively ensure the detection accuracy. Specifications: Measurement Accuracy<= 1%. Measurement range up to 25 VDC. Slide potentiometer: module with 3P-2.54MM interface incorporates a linear variable resistor with a maximum resistance of 10K ohm. When you move the slider from one side to the other, its output voltage will range from 0 V to the VCC you apply.Especially suitable for volume control, lighting regulator and other DIY projects. Specifications: Working voltage: 3~12V DC. Working Current: 0.24mA. Slide stroke: 30mm. Rocker switch: module is based on two feet 2 files rocker switch control module, the output of a switch, the switch that outputs a high level when you press the ON side, that output low when pressing the OFF side. Suitable for 3.3V and 5V. Vibration motor: This is a mini vibration motor suitable as a non-audible indicator. When the input is HIGH, the motor will vibrate just like your cell phone on silent mode. Specifications: Working Voltage Range: DC 4.5V- 20V. Current drain:<60uA. Voltage Output: High/Low level signal:3.3V TTL output. Detection distance: 3--7M(can be adjusted). Detection range: <140°. Delay time: 5-200S(can be adjusted, default 5s +-3%). Blockade time: 2.5 S (default). Trigger: L: Non-repeatable trigger H: Repeat Trigger (default). Work temperature:-20-+80°C. Light sensor: The Light sensor module uses the GL5528 photoresistor to detect the light intensity of the environment. The resistance of the sensor decreases when the light intensity of the environment increases. The chip LM358 is used as a voltage follower to enable you get a accurate data. Infrared emitter: module is based on the infrared emission infrared emission control module 940, the infrared signal emitted by the transmitter tube 940nm wavelength, the signal can be acquired by an infrared receiver module is a few meters away and demodulation, encoding and decoding process can be achieved with the remote control function. Dupont line 1*40P: hook-up wires. MicroSD card adapter: The module is a Micro SD card reader module, and the SPI interface via the file system driver, microcontroller system to complete the Micro SD card read and write files. Users can directly use the Arduino IDE comes with an SD card to complete the library card initialization and read-write. Supports Micro SD Card, Micro SDHC card (high-speed card). The level conversion circuit board that can interface level is 5V or 3.3V. Communication interface is a standard SPI interface. Control Interface: A total of six pins (GND, VCC, MISO, MOSI, SCK, CS), GND to ground, VCC is the power supply, MISO, MOSI, SCK is the SPI bus, CS is the chip select signal pin; 3.3V regulator circuit: LDO regulator output 3.3V as level converter chip, Micro SD card supply; Level conversion circuit: Micro SD card into the direction of signals into 3.3V, MicroSD card toward the direction of the control interface MISO signal is also converted to 3.3V, general AVR microcontroller system can read the signal. Specificatons: 4.5V - 5.5V, 3.3V voltage regulator circuit board. Positioning holes: 4 M2 screws positioning hole diameter of 2.2mm. Size:45 x 28mm. Net weight:6g. 4 digit display: The module is based on a decimal point display module, it displays four digital tube (0.36 inches), and driver IC is TM1637, only two signal lines can make MCU control four Digit 8-segment LED. Can be used to display decimal, letters and so on. Passive buzzer: This is 5V passive buzzer module, and it is a piezoelectric speaker. The user can set the PWM output frequency and duration to produce different tones, beats according to the song numbered musical notation. Specifications: Operating voltage: 3.3 - 5.2VDC. Operating Current: 25mA (max). 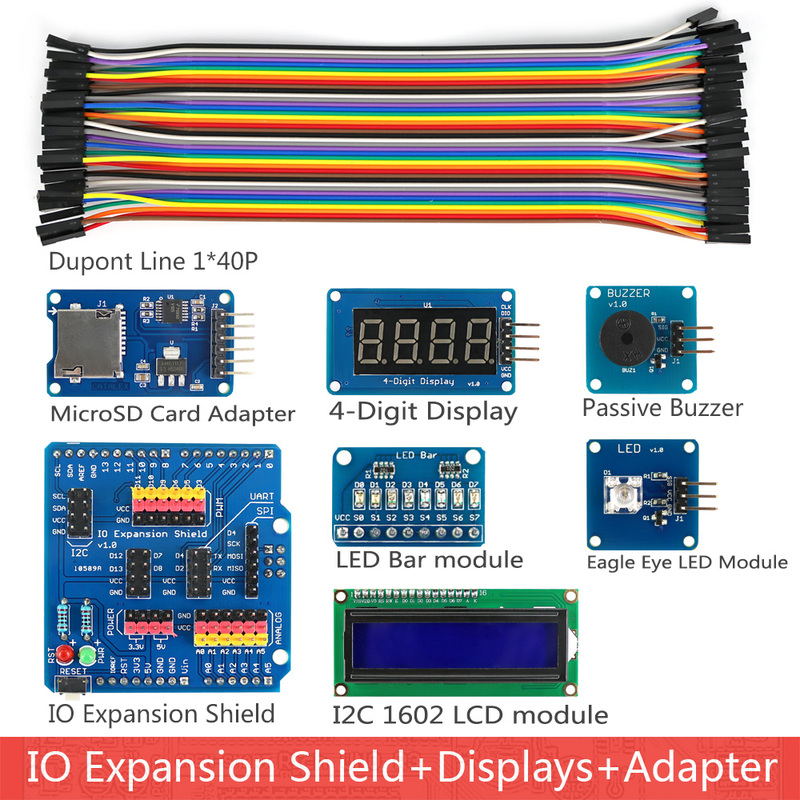 IO expansion shield: The Sensor Shield ( IO expansion board ) is compatible with Ar duino UNO / Leonardo / Mega2560. It is a connection bridge between the electronic building block modules and the Arduino board. It extends SPI interface, UART interface, I2C interface, PWM interface and analog interface of Arduino board, so DIY enthusiasts, ar duino interactive designers can quickly attach the modules to the Arduino board and accelerate project development. Compatible with Arduino UNO R3, Leonardo R3, Mega2560 R3. On-board reset circuit, power and reset indicator. LED bar module: This is an LED display module with 8 LEDs on-board, and low level can light the corresponding LED. Especially suitable for MCU IO test and experiments, multi-channel wireless control indicators. Eagle eye LED module: The module is a high efficiency green piranha LED module. Give a high signal to light up the Piranha LED. Specifications: Power supply 3.3 ~ 5.5V DC. High drive currents needed. I2C 1602 LCD module: The module is a 2 line 16 character LCD module with I2C interface and it is a basic character LCD screen for lots of applications.It is compatible with Ar duino UNO R3 / Mega2560 and it can be used to display real time clock, temperature and humidity. Specifications: I2C Address: 0x27. Resolution: 80 * 16. Display Size: 2.6 inch. Power: 4.5~5.5V. Current: 80mA. Interface level: 5V. Used in conjunction with the Arduino board, the ProtoShield prototype expansion board can be used to assemble custom circuits for prototyping It allows direct mounting of soldered components on the board, or connection through a mini breadboard. The breadboard is mounted via double-sided adhesive connections. ProtoShield prototype expansion board with two buttons and two LED circuit can be used directly, all of the pins and the power leads are Arduino-compatible. The Biomaker Starter Kit also includes a µLCD-32PTU-AR, an Arduino Display Module Pack, which includes a uLCD-32PTU 3.2" LCD Display with Resistive Touch, a 4D Arduino Adaptor Shield and 5 way interface cable. The uLCD-32PTU-AR customises the µLCD Display specifically for interfacing with the Arduino, to provide a quick and easy interface without any wiring hassles. 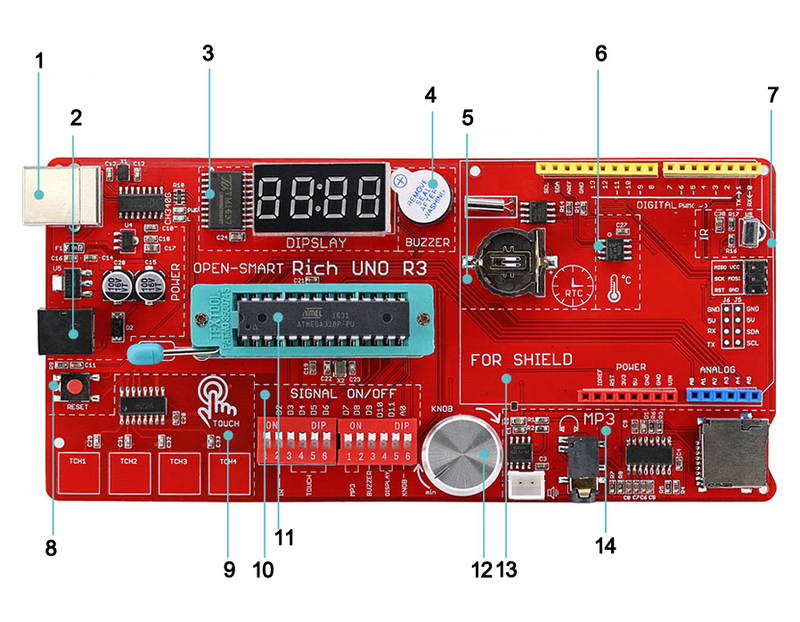 The Arduino Display Module Pack enables an Arduino user to quickly connect the 4D Arduino Adaptor Shield to their Arduino, connect the 5 way cable between the Adaptor and the Display Module, and be connected in seconds to start programming their new 4D Systems Display. The µLCD-32PTU-AR has a comprehensive range of serial commands ready to be received from the Arduino, to draw primitives such as lines, rectangles, circles and text, displaying images, playing sound and logging data to uSD card. It can utilise the Arduino's UART Serial Port and a single Digital pin. 4D Systems also provides a graphical programming environment, Workshop4 ViSi-Genie, for the code-free assembly of sophisticated user interfaces. You can find more information about this on the following page.